Teen life is suffused with technology. The vast majority of teens in the United States have access to a smartphone, and 45% are online on a near constant basis. The ubiquity of social media and cellphones and other devices in teens’ lives has fueled heated discussions over the effects of excessive screen time and parents’ role in limiting teens’ screen exposure. In recent months, many major technology companies, including Google and Apple, have announced new products aimed at helping adults and teens monitor and manage their online usage. As they look at their own lives and those of their peers, most teens see things that worry them. Roughly nine-in-ten teens view spending too much time online as a problem facing people their age, including 60% who say it is a major problem. When it comes to evaluating their own online habits, teens express mixed views about whether or not they themselves spend too much time on various screens. Roughly half (54%) believe they spend too much time on their cellphone, while 41% say they spend too much time on social media. By contrast, only around one-quarter (26%) believe they spend too much time playing video games – comparable to the share (22%) who say they spend too little time gaming. Meanwhile, roughly four-in-ten teens say they spend about the right amount of time on social media or gaming. 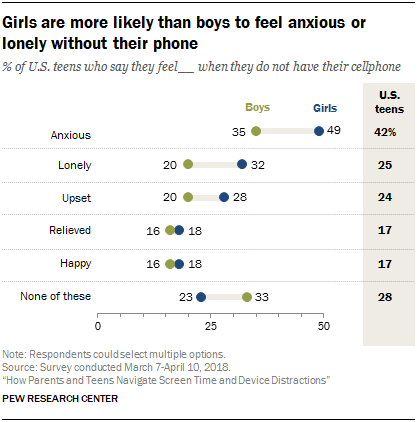 Boys and girls have differing perceptions of the amount of time they spend using various technologies. Girls are somewhat more likely than boys to say they spend too much time on social media (47% vs. 35%). By contrast, boys are roughly four times as likely to say they spend too much time playing video games (41% of boys and 11% of girls say this).1 There are no notable statistically significant differences by race and ethnicity or household income. Along with asking teens about their views of screen time and distractions due to the technologies in their lives, the Center also fielded a separate survey in which parents of teenagers shared their views about a subset of these issues. At a broad level, this survey finds that parents are somewhat less concerned about their own technology use than teens are about theirs. 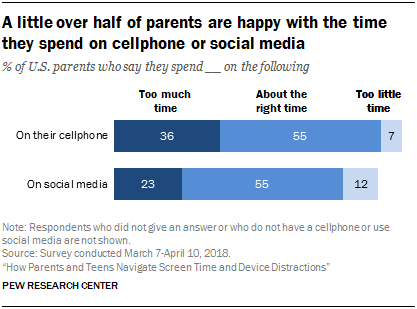 Around one-third of parents (36%) say they spend too much time on their cellphone, and 23% say the same about their social media use. Slightly more than half of parents (55% in each case) believe they spend the right amount of time on their cellphone or on social media.2 For the most part, parents of different genders, races and ethnicities, and income levels report similar levels of concerns about their own technology use. When asked to reflect on their teen’s cellphone use, a majority of parents (72%) feel their teen is at least sometimes distracted by their cellphone when they are trying to have a conversation with them. Indeed, 30% of parents say their teen often does this. At the same time, this sense of distraction caused by cellphones is not an entirely teen-specific phenomenon. 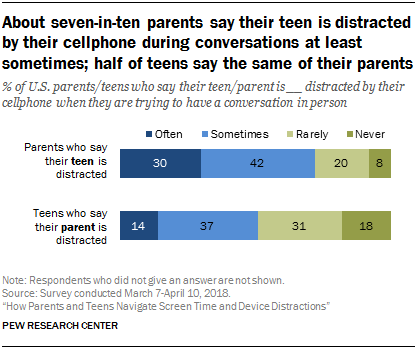 When asked this question about their parent’s behavior, half of teens say their parent is distracted by their own phone at least sometimes during conversations between them (51%), with 14% of teens reporting that their parent is often distracted in this way. When responding to questions related to their cellphone use, parents and teens diverge in some ways but not in others. 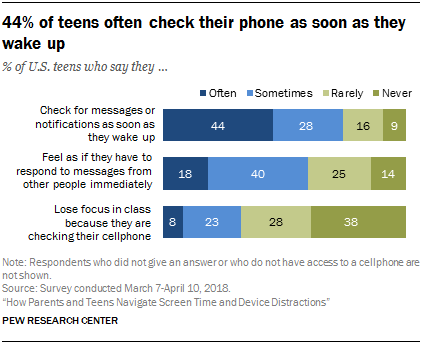 Teens are much more likely than parents to say they often check their cellphone for messages or notifications as soon as they wake up (44% vs. 26%). 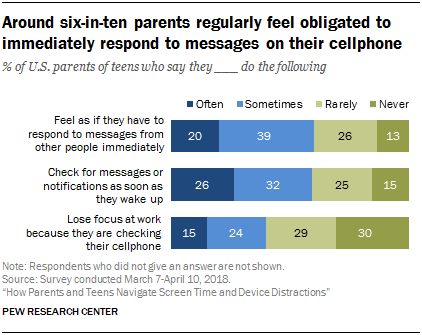 But similar shares of parents and teens often feel as if they have to respond to others’ messages immediately (18% of teens and 20% of parents say this). And parents are actually more likely than teens to report out-of-home distractions due to their cellphone. 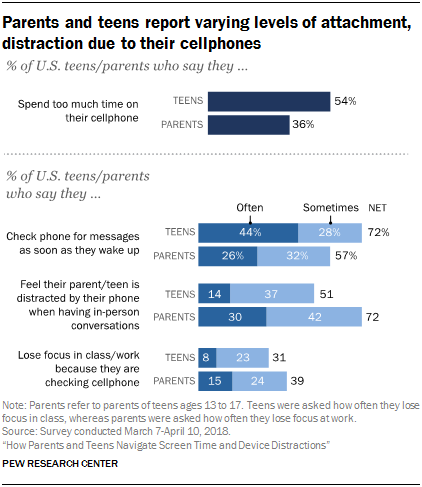 Some 15% of parents say they often lose focus at work because they are checking their cellphone – double the share of teens (8%) who say they often lose focus in class for that reason. 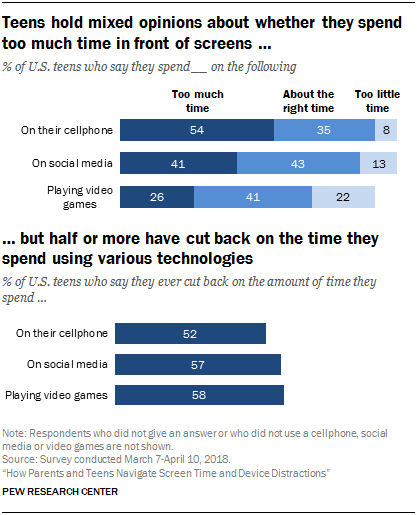 While teens’ opinions about whether they spend too much time on technologies vary, parents largely agree that too much screen time for their teen is an area of concern. 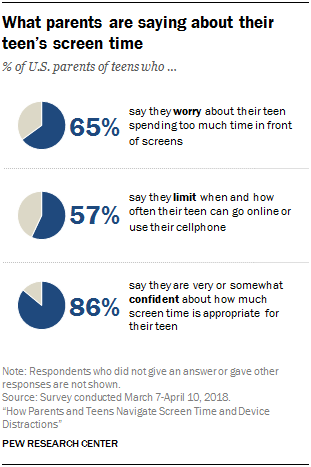 Overall, around two-thirds of parents (65%) say they worry to some extent about their teen spending too much time in front of screens, with one-third saying this worries them a lot. Additionally, more than half of parents (57%) say they limit when or how long their teen can go online or use their cellphone, including about a quarter who say they often do this. 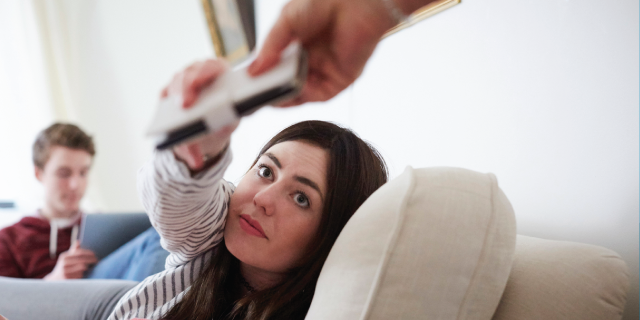 Using a somewhat different question wording, a 2014-2015 Pew Research Center survey of parents found that a similar share of parents said they ever set screen time restrictions for their teen. Not only do the majority of parents take actions to limit their teen’s screen time, but most parents are at least somewhat confident that they know how much screen time is appropriate for their child (86%). This pattern holds true across multiple demographic groups such as gender, race and ethnicity, and educational attainment. In fact, four-in-ten parents are very confident about the right amount of screen time for their teen.